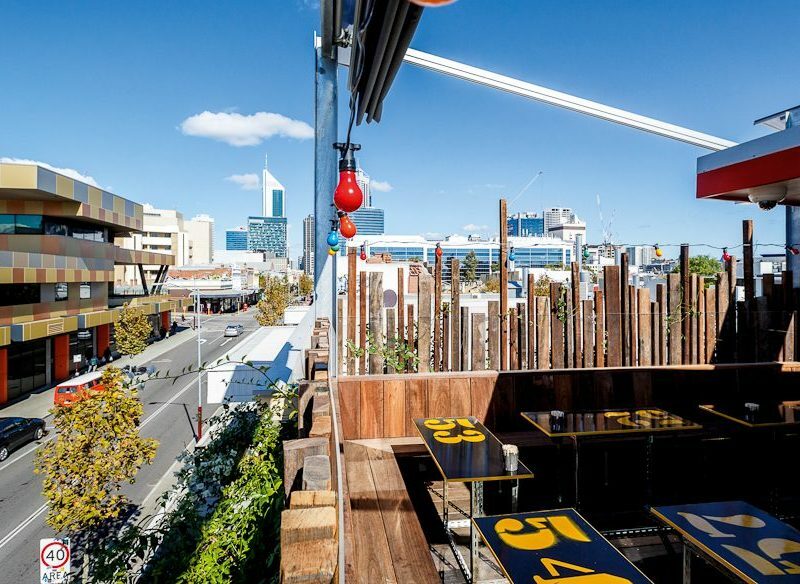 Noodlebar and Laundry with a view, Lucky Chan's, Northbridge (photo: Jessica Wyld). There are few times Perth people will voluntarily queue. Big name rock stars, yes; Derby AFL games, sure, and when the latest, hotter than hot restaurant opens. Lucky Chan’s Laundry + Noodlebar obviously falls into the latter category. The ‘Laundrobar’ Lucky Chan’s (photo: Jessica Wyld). But rather than bursting onto the scene with a supernova explosion then fizzing out like sparklers, as new places often do, the buzz over the tri-level, pan-Asian eatery hasn’t waned since its April launch. So it should have come as no surprise that, on the Saturday night we visit, there’s quite a line outside. The fervour over Lucky Chan’s began well before its cleverly disguised doors were thrown open. Its owners launched a crowdfunding campaign in 2014 and raised $112,000 on Pozible. It turns out people liked the idea of a restaurant named after a mysterious man of questionable fashion sense who was plastered over the restaurant’s website. 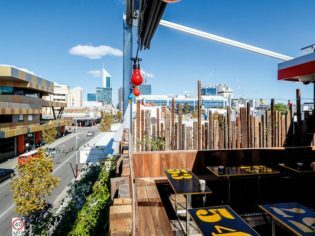 Lucky is, of course, fictional, but through him the venue pays homage to the Asian immigrants who have dotted Northbridge’s streets with oriental outlets. Lucky Chan’s celebrating its laundry co-status (photo: Jessica Wyld). On entering, you get the sense this quirky guy might’ve had a hand in the décor, too. The frontage is mischievously deceiving: rows of washing machines face the window. Inside, the stairwell is decorated with ironing boards and holey light fittings suggest they’re made from washing machine tubs. Upstairs, mini red Chinese lanterns hang from a ceiling with tea towels threaded between wooden rafters. Then there’s the bar made from mahjong tiles and the rooftop strung with party lights. It’s very well done. The food is inspired by David Chang’s mod-trad take on Asian. Danny Matthews is now at the helm, aided by a guy who pumps out fresh ramen noodles and gyoza skins on a custom machine in a glass cube upstairs, and two Asian ladies who put the from-scratch dumplings together. It’s fancy fare, made to feel casual. We kick off with a bowl of pigs’ ears that have been braised in master stock for eight hours, pressed then refrigerated, sliced and deep fried. Crisp, no; gelatinous, yes, and excellent with the on-tap craft beer. Yes, Lucky Chan’s is an actual laundry (photo: Jessica Wyld). The Penang duck dumplings, served in a rose pink pool of curry sauce, are too mushy to win us over, but the house specialty, the ramen, does. It took the owners 36 attempts to perfect their noodle recipe, and they sell 1500 bowls a week. Our ‘cheeky ramen’ justifies the effort: we love the springy, chewy strings in a dark broth. Topped with fall-apart pork cheek and Asian mushrooms, I struggle with the roast tomato and broccolini additions, but it fits the kitchen’s penchant for modern twists. Fried, buttermilk chicken bao errs on the dull side – the pineapple sweetened beef shin version is better – but dessert brings us back. Coconut pannacotta is topped with crumbly honeycomb, pineapple ribbons and a sorbet poked with lime gel and chunks that taste like childhood lollies. Dessert: Coconut pannacotta topped with crumble honeycomb (photo: Jessica Wyld). Fine work, Lucky Chan. Maybe even worth queuing for. Verdict: A bubbly night out that’ll leave you full as a goog and feeling oh-so hip. We rated: The fit-out is cleverly done, pushing a whimsical theme throughout without becoming kitsch or commercial. The place feels fun. And it’s open until 2am. Great Wall of Chan (photo: Jessica Wyld). We’d change: The food needs to be brought up a level to match the surrounds. It’s good but lacks the breathtaking flavour punch you expect from all the hype. Notes: You can’t book, so turn up and try your luck.